VITAL IMAGE provides cinematographic and motion-picture services to the film and television industry throughout Australia. Regardless of your requirement in terms of equipment or personnel - or your 'physical' location, VITAL IMAGE can deliver. We can provide a range of professional Broadcast Television cameras. From South Australia's only High Definition Sony CINEALTA 900R video camera to a range of Sony DigiBetacam cameras, VITAL IMAGE can meet your every need. We can provide some of Australia's most experienced cine camera-operators with our equipment or, depending on your needs, we will 'dry hire' our cameras (with the exception of the CineAlta). 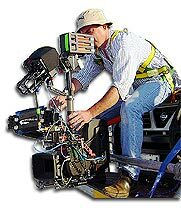 VITAL IMAGE is also one of Australia's most significant suppliers of Steadicam services. We have three Steadicams for hire with Operator Andrew Stankovich. Our latest Steadicam is a waterproof model and can be mounted on boats or for pool-side shots - in fact anywhere there is a hostile/water envkironment. Vital Image's Steadicam services are highly regarded both within Australia and overseas. We can provide experienced crews for your next production. From DOPs, camera operators, assistants, sound operators and so on, we can cater for large or very small productions. Our crews are among Australia's most experienced and many are winners of substantial industry awards. We can also supply a wide range of camera assists, lighting and audio equipment and 'grip' gear. 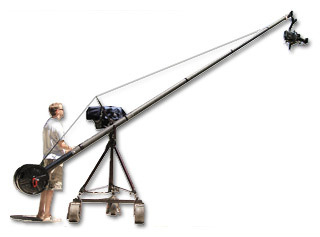 We have aquired a JIMMY JIB providing producers with the ability to acquire spectacular high or low shots, or sweeping camera movement. When viewers say: "How did they get that shot? ", often a Jimmy Jig was involved. We can also supply a Location Video Split and data recorder which will record up to 8 hours of daily rushes to DVD/Digital Betacam quality. Now producers can have a copy of daily shoots, ready to go, at the end of the day, with a burnt-in Time Code window -- without touching master camera tapes..
We can also provide a range of post-production services. We can also 'deliver' your TVC, 'infomercial' or documentary to any of the Broadcast Television formats - or to any of the emerging formats including progressive and steaming download for Web applications, Flash, WMP, QT or Real compression, or compression for IPod or 3G technologies. See our own example of our work, in 'Flash' format, by going here. We can also arrange Web or Powerpoint presentations to complement your video/s and arrange the 'hosting' of your video in the Web environment, where you may not have a website of your own. We invite you to explore our website for further information - or contact Andrew Stankovich on 0412 829 299.